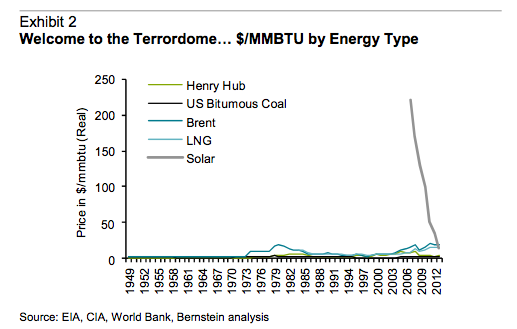 Why in the world does this chart have PV being priced by mmbtu rather that levelized cost of electricity? MMbtu might be appropriate for water heating, but not for electricity. What is the difference, if all energy sources presented at the chart, use same measurement units? And that falling curve in the 2003/13 would not change it's direction, nor it's angle towards the axis. home page Even if we turn to cost of electricity as a method of comparison, I doubt it we would see much of a change.